The Buzz Piece » A Harley-Davidson Cafe Racer? Jun 25 A Harley-Davidson Cafe Racer? When one thinks of a café racer, it’s generally not a Harley-Davidson that comes to mind. A Yamaha? Sure. A Honda? Definetly. Heck, even a Triumph. But a Harley? Not really. I mean, it’s been done but still, the two terms have always seemed kind of the antitheses of one another. But not anymore. Harley has announced it is about to put out its sportiest new bike, modeled after the café racers of yore, in the United States. 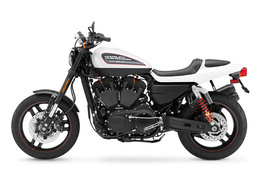 If a large segment of Harley riders already deride the Sportster, I can’t wait to see their take on the XR1200X, with its slim, higher-riding and uber-sporty design. To oversimplify, café racers are bikes, generally 70’s Japanese models, cut down in every possible way to maximize speed, comfort be damned. Though there seems to be more and more of these modified motorcycles out there every day, they first became hip decades ago, and now that retro aspect is part their draw. But these are exactly the kind lightweight bikes that the U.S. hog crowd has always guffawed at. The XR1200X, in fact, was only made for export markets initially. But the Harley-Davidson brass, likely seeing modified café racers all over the place, pronounced them a good fit for American buyers. Café racer with modern technology, no modification necessary. They’re set to come out later this year as 2011 models. Very well written article. It will be valuable to anybody who usess it, as well as me. Keep doing what you are doing i will definitely read more posts.